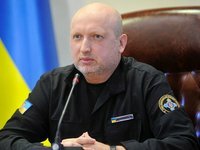 Oleksandr Turchynov, the Secretary of the National Security and Defense Council of Ukraine (NSDC), has said that despite the war, Ukraine is reforming the security and defense sector according to NATO standards. Secretary of the National Security and Defense Council of Ukraine held a meeting with the group of foreign high-level strategic advisers on defense reform under the Reform Committee of the Ministry of Defense of Ukraine and the Armed Forces of Ukraine, the press service of the NSDC reported on Thursday. "We do not wait until the war is over to complete the reform and move to NATO standards", the NSDC Secretary said. According to him, the recently adopted Law "On National Security of Ukraine" initiated by the NSDC of Ukraine, laid the foundations for building a modern European model of the security and defense sector of our state. "For our state, the strategic goal is to become a full-fledged NATO member, and in the long run - of the EU. We understand how much more work is still needed to achieve this goal, but we are ready for this," Turchynov concluded. In their turn, strategic advisers acknowledged how much Ukraine has done to reform its security and defense sector. "We see all the efforts you are making to reform, and we support a comprehensive interagency general approach to this vital issue. We are here to provide Ukraine with the best chances for future NATO membership," U.S. adviser Lieutenant General Keith Dayton said. The following advisers attended the meeting: from the United States - Lieutenant General Keith Dayton, from the United Kingdom - General Nick Parker, from Germany - Lieutenant General Volker Halbauer, and from Canada - Executive Director for External Relations and Partnership at the Canadian Defense Academy of the Ministry of National Defense Jill Sinclair.